Even as the disastrous Yosemite Rim Fire was getting snuffed out, I was thinking of the interesting photographic opportunities that could ‘rise out of the ashes’. I hoped to wander the burnt forest with a silent blanket of snow. Stark, high-contrast black & white compositions with no sign of life. Perhaps with threatening, looming clouds to add to the drama. But the west side is a long way from Mammoth once Tioga Pass is closed, and those image were never realized. Early this spring I went searching for the juxtaposition of emerging spring growth and burnt forest. I was greeted by interesting moss and tiny plants clinging to the rich dark dirt. Mushroom clung to the north side of blacken trees and the smallest pine seedlings were emerging. I took note to return to see the forest develop. Yesterday’s thunderstorm were clearing as I drove east up Highway 120. A scenic overlook surveyed the vast area burnt landscape, yet a lush blanket of green covered the the mountainsides. I took the road toward Hetch-Hetchy to revisit the burn area I explored months before. In a few miles, I rounded a corner to brilliant fields of fresh grass and flowers. What was once a scene of dark muted tones was now a spectacular palette of color. (Well, almost..) The fresh rain darken the earth and refreshed the vibrancy of the spring flora. 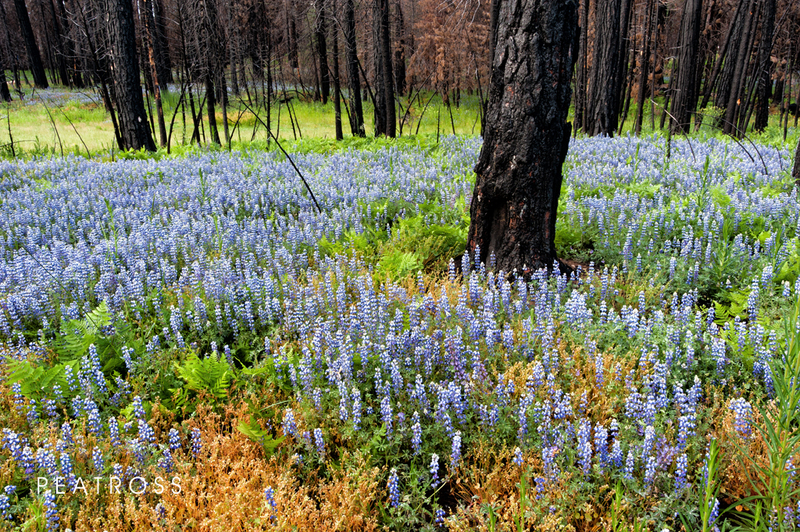 Patches of Lupine and little yellow flowers lay in harmony with the rust and orange. Meadows of grass blended into ferns at the edge of the forest. Everything covered with tiny droplet of rain water. The colorful carpet of life amongst the pillars of blacken pine forest provided an excellent photographic adventure. But the fading evening light limited time to compose. I’ll be visiting this location again.